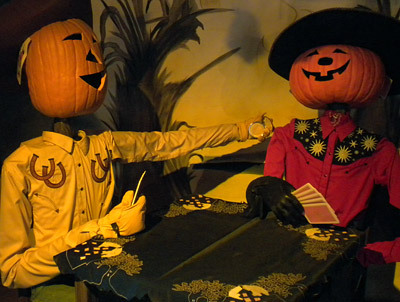 The idea, we can only assume, is that the cheatin’ punkin’ is using a mirror to look at his companion’s cards. Well then, why the heck is he pointing the powder-holding portion of the compact at the other guy’s hand instead of pointing the mirror there? And, even more important, what the heck is a male pumpkin doing with a woman’s compact??? Seriously — you don’t think the other pumpkin would notice something was out of place? Particularly since, as everyone knows, pumpkins don’t wear makeup in the first place!!! Come on, Disneyland, you’re better than this. The least you can do is close the park down for a few hours — you know, on an emergency basis — and get this taken care of before you embarrass yourself any further. While you’re at it, we’d like to know where the rest of the deck of cards is, too. If we had time, we could say a whole lot more about the little Halloween area’s minor shortcomings. Those pumpkins that the guy is spending so much time carving taste terrible. Also, that “cow” is totally fake. And don’t even get us started on the goats wearing bandanas, as if goats know how to tie square knots! We needed to do a little further research before we continued the Disneyland Tour that we began some months ago and then abruptly abandoned like a duckling the day after Easter, so we have spent a few days at Disneyland over the past few weeks, getting the latest baloney on many tems. While there, we noticed a number of interesting things which we will post about for a day or two. 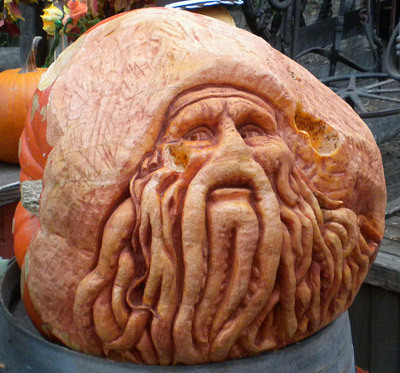 Upon seeing this, we had to ask ourselves, “What is a carving of Cthulhu doing at Disneyland?” And having asked ourselves this, we had to ask the pumpkin-carving castmember about it. He hemmed and hawed a bit, then made some sorry excuse about it being a carving of a pirate! Since when is Cthulhu a pirate? Given this evidence (combined with Disney’s well-known avoidance of trademark/copyright violation), I think it is more than safe to assume that Disneyland has obtained the rights to all of H.P. Lovecraft’s literary works and will be building some kind of Lovecraft-themed extension to either Disneyland or Disney California Adventure. Lovecraft land will definitely be an awesome addition to the resort. We look forward to riding the Madness Mountain rollercoaster (safety spiel: “Remain seated please; ph’nglui mglw’nafh Cthulhu R’lyeh wgah’nagl fhtagn”) and drinking a glass of Miska-tonic with our Dunwich Sandwich at the Innsmouth Inn! Yesterday, Disney announced that they had secured the limited North-American domestic retail non-seasonal theme-park rights to the movie Avatar, and would soon be creating a new Avatar-themed land in Florida’s Animal Kingdom. Today, they released additional details, including a very important correction. In more recent years, then Disney-MGM Studios had to retract its announcement of the creation of a real-live Sesame Street when it was realized that somehow Disney had forgotten to purchase most of its related characters when it bought the Muppets from Henson Productions. And who can forget the happy accident of Disney, intending to obtain the licensing rights for the state of Indiana, accidentally licensed the Indiana Jones movie franchise. So it is with a sense of optimistic hopefulness that Disney must correct its previous announcement about the licensing of characters and locations from the film Avatar. It turns out — and we’re sure you’ll find this as funny as we did — that instead of licensing the James Cameron film, our property acquisition team somehow managed, through a little honest miscommunication, to license the television show Avatar, which was recently made into the M. Night Shyamalan film, The Last Airbender. Although there may be some fans who are disappointed, we think this is a great opportunity. Market research conducted last night revealed that our original plan to create enormous animatronic Na’vi that could be mentally controlled by selected guests would likely have not been popular at all. Guests really don’t want to have to go to all the trouble of hooking up electrodes to their head just to play with a huge alien robot in a thoroughly realized artificial alien world. Research also indicated that guests would be disappointed with the land if it lacked certain elements from the film, such as free-roaming dangerous animals and an atmosphere that’s deadly to humans. Thank goodness Disney didn’t go through with this and similar plans only to find out that guests didn’t like them! Instead, we will be devoting close to a billion dollars to creating a world right out of The Last Airbender. There will be, for example, enormous animated fountains that use air instead of water, a bald white kid signing autographs, and — well — a bunch of other neat things that we’re going to be thinking of really, really soon. This will be an expansion Animal Kingdom can be proud of! 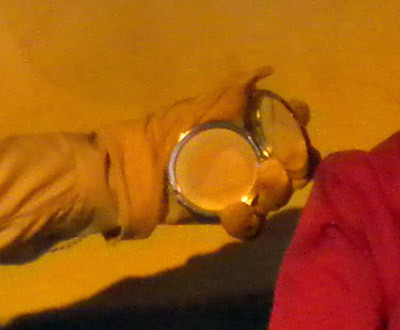 For those James Cameron fans who are still feeling a bit let down, don’t forget that Disney Studios’ Great Movie Ride still has an awesome Aliens scene with a character that looks just like Dr. Grace Augustine with a gun! Having to make a sudden change in plans has opened up a Pandora’s box (no pun intended) of difficulties for Disney. They had already contracted with dozens of former basketball players who were willing to be painted blue every day and depict Na’vi, hundreds of pounds of unobtainium had been purchased to construct trash cans for the new land, and the song that was going to bridge the transition from Animal Kingdom’s Asia area into the Avatar area — Survivor’s new hit, “Eywa the Tiger” — had already been recorded (it will be released online as a free download). Thankfully, the worldwide popularity of The Last Airbender — a film with enough die-hard fans to nearly fill a high school gymnasium locker room — practically makes Animal Kingdom’s new Avatar land a shoe-in for success. A few days ago, Disney’s Aulani resort opened on the island of O’ahu, but already the new resort is shadowed beneath a cloud of shame (or volcano smoke — in Hawaii, it can be hard to tell the two apart). Even before the resort opened its doors, all of the key executives responsible for its construction were asked to either resign or be reported to their parents and receive several demerits which would become part of their permanent record. All chose resignation. Building the entire resort on the wrong island (O’ahu, instead of Catalina). Forgetting to lock up for the night when they left, so a toucan got in and made a big mess that it took like an hour to clean up (plus it ate all the grapes). Draining the main pool and packing it with hungry tarantulas. Enforcing a “No shirts, no shoes, no beachgoing” policy. Leaving a cursed tiki on the beach for Bobby to find. Forgetting to check if the “Fire-Dancing Goofy” costume was flammable. Making distinctly un-Disney “Don Ho” puns. Approving the “Sacrifice a Disney Princess to the Volcano God” pageant, Jessica Rabbit Hula Dancing Class, and Three Little Suckling Pigs Luau. Not taste testing the cocoanut churros. Letting guests buy timeshares for a nickel. Because, apparently, there is some sort of trademark issue regarding Harry Potter, the entire resort had to be quickly converted to a more easily licensed “Hawaii Five-0” theme (as the commercials say, “You want suites? Book ’em, Danno!”). Disney’s crack legal department has also recommended that other projects in which these executives had a hand be examined for potential areas of difficulty. For this reason, executives are investigating several Shanghai Disneyland attractions currently under construction, even though the (former) management insists that there is nothing related to Harry Potter anywhere on the property. Attractions being scrutinized include The Enchanted Dalek Room, Cylonland, “it’s a borg world,” Buzz Lightyear Aliens Blasters, Skeletor Mountain, Pirates of the Planet of the Apes, “Honey, I Blew Up the Terminator!”, Mr. Toad’s Matrix Ride, and Emperor Palpatine’s Castle, among others.